Clarinetist John Moses, a member of Local 802 since 1966, is at the top of his game. 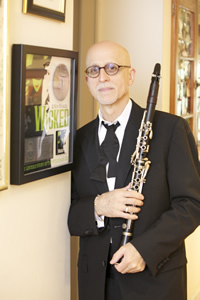 He’s performed with virtually every major ensemble in the area and is currently the first clarinetist with the American Composers Orchestra, the New York Pops and the Westchester Philharmonic. He’s also played with the New York Philharmonic, New York City Ballet, New York City Opera, New Jersey Symphony, St. Louis Symphony, San Francisco Chamber Orchestra (Amici della Musica) and the Royal Philharmonic of London. John has been honored with five Grammys for his work on Broadway, where he has played over 26 shows, including “Wicked” for the past 12 years. He has been featured on over 200 film scores and has played on all the major TV variety and talk shows. 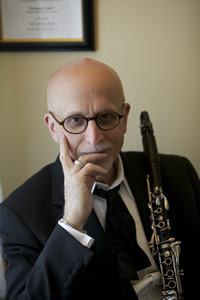 A graduate of Juilliard, John taught clarinet at Brooklyn College and Queens College and lectured at Yale, Curtis, Eastman, Mannes, NYU and the Manhattan School of Music. He has recorded with a wide variety of people, including Marilyn Horne, Celine Dion, Placido Domingo, Mandy Patinkin, Wynton Marsalis and Judy Collins. John recently sat down with Local 802’s Bob Pawlo to give us his thoughts on his eclectic career in music. Bob Pawlo: How did your musical journey begin? John Moses: It began in Oak Park, a suburb of Detroit. We had moved out there from New York when I was about 10. The band director told me, “I really need clarinet players. Why don’t you play clarinet?” That’s how it started. I started studying privately at about 11. At 13, I had a terrific teacher, the first clarinetist in the Detroit Symphony, Herbert Couf, who encouraged me to go to Interlochen. I went there for five summers and enlarged my musical scope by 200 percent. Bob Pawlo: Were your parents from a musical background ? John Moses: Very musical people, very supportive. My father sang in the choir at our temple and my mother was a fairly good pianist – self taught – but they both had very musical tastes. We always had music playing around the house. My dad loved Brahms and jazz. My mother was a Broadway show and movie lover, so she turned Broadway shows on when my dad left the house. Bob Pawlo: Did you attend Detroit Symphony concerts to hear your teacher? John Moses: Yes, and to hear Charlie Sirard on bassoon, flutist Albert Tipton, and concertmaster Mischa Mischakoff. Paul Paray conducted. It was a fabulous orchestra and I learned as much there as I had on the radio. Also, I went to jazz clubs. I heard Miles, Monk, Coltrane and Ornette Coleman. John Coltrane blew me away; he turned me on to the saxophone. I went back to Mr. Couf and asked, “Can you teach me how to play the saxophone?” He told me to come to a certain club on Friday night. Couf was a closet jazz musician – he played in the Detroit Symphony during the week and played in jazz clubs on the weekend. Bob Pawlo: When did you decide to go into music as a career? John Moses: I went to the University of Michigan, where I played in the marching band under William Revelli. He was considered the Toscanini of the symphonic band. He taught me a lot about music that I really found was true later in New York City, which was that there was a very dark side to the music profession and you have to be careful what you say and what you do. I also studied with Alberto Luconi, who was a great old teacher. He was Toscanini’s prize clarinet player in Italy, brought over here to play at NBC, and he had retired to the University of Michigan. He was unbelievable. I also studied saxophone with Larry Teal, then with my friend Donald Sinta. Eventually, my dad told me that if I wanted to go into music professionally, I’d have to fly to New York and audition for Juilliard or the Manhattan School of Music. I got into both, but Juilliard gave me a scholarship, so that’s where I went. I first signed up to study with Bernard Portnoy, who had been the first clarinetist of the Philadelphia Orchestra. I studied with him all the way through my undergraduate and master’s degree. I also traveled to Philly to take lessons with Anthony Gigliotti, to D.C. to take lessons with Buddy Wright, and to Boston to study with Gino Cioffi. Bob Pawlo: What concepts did you learn from them that led you to have such a flexible career? John Moses: Mr. Portnoy taught me how to play symphonic music, how to take an audition, what conductors would look for, what to do and what not to do in terms of legit clarinet playing. He made me very flexible in terms of the literature of the symphony orchestra. Bob Pawlo: Were you continuing with the sax at the same time? John Moses: Yes, I was. I was playing in little groups, which Mr. Portnoy didn’t know about, and worked the Catskills in the summers. I became first clarinet in the orchestra during my second year at Juilliard, which was conducted by Jean Morel. We really got along great. Basically it was Jean Morel who encouraged my symphonic career. Bob Pawlo: Is that when you also studied with Joe Allard? John Moses: Yes. I took about 50 lessons on reed making with Joe, which also included his techniques on breathing and overtones and dozens of other things. You didn’t just study reeds but that’s what I thought I was there to study. Bob Pawlo: What was your first lesson like? John Moses: It was like opening up the world of musical knowledge. Each chapter was eye opening and awe inspiring. Everything Joe said made sense. He never said anything trivial. He never said anything that didn’t make complete sense. He never said anything that was demeaning. Everything he said was helpful. I was overwhelmed by his knowledge of people, music, and the arts in general. Bob Pawlo: What concepts did he instill in you that helped you for so many years? John Moses: Always be flexible. Always understand what a conductor needs and wants. Never force your ideas on the leader. Be cooperative with your colleagues. If they’re playing flat, play flat. Joe used to say you have to be flexible enough to play out of tune in the right way. That was amazing. And then he taught me to voice the clarinet in a special way so that it would always be unique. So don’t try to sound like anyone else. Have your own unique voice – and by that, Joe meant playing the overtone series on the clarinet in a very special way. Always have your equipment in top-notch condition. It’s never an excuse to have something not work, including your body. Making the clarinet work with your breath and support and overtones all are important factors that you can’t let slide. You always have to practice those. Bob Pawlo: Could you tell us about Joe’s concept of “tonal imagination”? Copland, you need to sound American, which is a combination of German and French. Good examples are Daniel Bonade, Harold Wright or Robert Marcellus. Joe played with Ralph McLane and had a great American sound. So Joe could have us produce that sound when not playing a particularly Germanic or French piece. Bob Pawlo: After completing your studies at Juilliard, how did you proceed? Bob Pawlo: So be careful when you warm up. John Moses: That’s my advice to all young students. Watch what you play privately, because it might be heard, and become very important in your future. Bob Pawlo: That’s incredible. After playing with Stokowski, where did you go? John Moses: I went on the road with the Royal Philharmonic of London under Dorati. I also played with the St. Louis Symphony and the the San Francisco Chamber Orchestra. I then decided to go back to New York. I auditioned for the New Jersey Symphony under Henry Lewis, the first black conductor in America to lead a major orchestra. And Maestro Lewis and I got along great. When I auditioned for him, I had expected the orchestra to provide the orchestral parts. I didn’t bring any of my own. I got onto the stage of Symphony Hall in Newark and Henry said, with a big committee of people there, “Play something for us.” I said, “Well, where’s the music? He said, “Just play anything you want.” So I started playing excerpts that I knew. And then Henry starting asking for excerpts. “Can you play Copland’s ‘Appalachian Spring’? Can you play ‘Bolero’?” He kept asking things and I kept playing them and he liked that. So again, I was hired on the spot. I stayed with the orchestra for five years. I also played with the New York Chamber Symphony that Jerry Schwarz had formed, and other groups in the early 80s. The Metropolitan Opera had a wonderful series of summer ballets at the Met and I got involved with that through bassoonist Loren Glickman. All the great ballet companies needed an orchestra. And we were the in-house orchestra at the Met. In the 70s, Lukas Foss asked me to play at the Brooklyn Philharmonic and I got to do that for about 20 years until Lukas retired. I also played with the Israel Philharmonic when they came to town as well as the Opera Orchestra of New York, and the Grand Opera with Vince La Selva. Bob Pawlo: Were you starting to do commercial work and recording? John Moses: Yeah. I was lucky there was a fellow in town I worked with named Herbie Harris. He was a well-known Broadway contractor and was also a substitute percussionist with the New York Philharmonic. He heard me because I had been subbing there too. He told me that he was about to start work on a Broadway show by Leonard Bernstein and he could probably get me in. It was called “1600 Pennsylvania Avenue” with lyrics by Alan Jay Lerner. I said, “Wow, it’s got to be a hit!” I thought it would be my first show – and maybe my last! Well, it lasted for seven performances. It was Bernstein’s only flop, I think. Bob Pawlo: But what was it like playing for him? Bob Pawlo: So the show flopped, but it was a success for your career because you got to work with such high profile people. John Moses: It put me into the Broadway circuit because it was Bernstein. Also, through Herbie I got offered other shows. Broadway was always exciting to me. On opening night, there were thousands of people out there. The energy was not at all like the symphonic world. Bob Pawlo: Around this time is also when you began your extensive recording career? John Moses: Exactly. First I got hired by Emile Charlap and then more and more contractors. And then it was word of mouth. The guys on the dates were asking for me to play certain woodwind parts that were either difficult or stylistically challenging. They knew that I could play many different styles and everything from klezmer to a classical thing. I was doing two or three jobs a day for many years. Then the movies came into New York. The recording studios in California had overflowed and New York was the quickest place to handle all the extra film soundtrack work. The jobs came in and I recorded hundreds of movies here. Bob Pawlo: This sounds like the golden age of recording in NYC. How did people handle so many gigs? John Moses: George Marge had a smart idea of having every instrument he owned in the trunk of his car. Let’s say George had to play oboe on a date and then they asked for alto flute. They wouldn’t have to call anyone else. George would go down to his car, bring up his alto flute and then he’d play. That was his trick. Harvey Estrin was also very flexible because he lived on Eighth Ave. near the recording studios and had everything available to him at a moment’s notice. He could play any instrument that was needed within an hour of the time he was asked to play. Myself, I could always carry all my horns with me. But the flexibility that we had to play was enormous. We had to play classical or jazz or pop, or bebop or Dixieland, any style on any date at any time from one hour to the next. The score would come through and you’d have everything from Scott Joplin type stuff in a movie score like “The Sting,” to a classical-sounding score by Ennio Morricone. Then Elmer Bernstein would come in and tell us that he’s not related to Leonard Bernstein. Elmer would conduct left handed and we’d all have a fun time with him and did great movies for him. Bob Pawlo: Weren’t you at the same time doing premiers of new music? John Moses: Yeah, they had formed the American Composers Orchestra. Paul Dunkel – a fine flutist – and Dennis Russell Davies, who I’d been a classmate with, asked me to play first clarinet with them. At night we were playing classical pieces by John Cage. Phil Glass had just started up with his minimalist style; we played a lot of his early music. We played Steve Reich and John Corigliano. We played all the contemporary composers and then enlarged it to American composers and then enlarged it to composers from the Americas, South America and Canada. And we did that afternoons and evenings. We rehearsed late or whenever we could, and put on concerts at Carnegie Hall. Bob Pawlo: What was it like when you first performed with Peter Schickele as P.D.Q Bach at Carnegie Hall? John Moses: He was insane. The concert was just crazy. It was sacrilege. We were creaming Bach. We had to stand up, whistle, stamp our feet, scream at the conductor and do other things that were totally outrageous. He actually used a swing to fly to the stage from the balcony. (See www.peterschaaf.com/schickele/carnegierope76 for a photo!) We did a dozen recordings that were very difficult to get through because we started laughing in the middle of the session. Bob Pawlo: At that point you were starting to play Broadway shows more. John Moses: I realized I didn’t just want to sub on Broadway, I wanted to have my own show. So “Sweeney Todd” came along and I thought it was a masterpiece. I got the job and eventually became a close friend of Stephen Sondheim. I went on to do all of Steve’s shows, including “Merrily We Roll Along,” “Assassins,” “Into The Woods,” “Follies,” one after another – they were all great. Everything he wrote was a masterpiece. Bob Pawlo: With so many different genres and styles, what is in your practice routine or mental preparation to be ready when the downbeat hits? John Moses: It’s like getting a mindset of flexibility. It’s like meeting new people and remembering everything about them. It’s like when the guy comes to your door to deliver mail, you say, “Hi Bill, how’ve you been, how are your kids?” And then when the guy comes to read your meter, you say, “Hi George, how’s your wife doing?” You learn people and you learn how to be flexible, and how to remember. You have to develop a great memory for style and for discipline and flexibility. The big word is flexibility. It’s both a mindset and a way of life in dealing with people and in dealing with yourself. If something comes along that is really irritating, you can’t let it be irritating during your playing or practice session. It can be irritating when things are over but not while you’re working. You’ve got to put your mind to the job at hand and do it at the highest level, no matter how you feel – which is where health comes in. Health is the most important factor in your career and life. Bob Pawlo: What qualities and ideas do you instill in your students for them to proceed in the music world as it is now? John Moses: I have a list of hints of what to do. You need to be in places where people can help you: clubs, bars, parties, social networking. Be flexible. Be adaptive. Become involved in any new projects. Create work or new ideas. Share your time and efforts. Most important: stay healthy. Take care of yourself. That’s up to you. Be tireless. Never be late. Be yourself. Don’t play up to others. Meet people and be open to them. Send e-mails, texts, phone calls and always promote yourself accurately. Be where musicians and teachers hang out: parties, discussion groups, chat rooms, anywhere where you can come in contact with new people and musicians. Ask others about themselves and be enthusiastic about their success. Be careful of what you say and to whom. It’s important to remember names, faces, places and jobs you’ve worked. Use your computer and all the newest devices to stay in touch and remain current. Learn to type well: I never did! Finally, join Local 802 or any AFM local where you live. Don’t be anti-union: it’s not fair to you and it’s not fair to your fellow musicians. I believe that union affiliation is necessary and helpful and inspiring. People at the union are there for you and you are there to help the union do its duty and help us in return. Stay current with what the union is doing and always contribute as much as you can to their causes.